It is Peter Laycock as a bright-eyed compère who explains the running of the show: we will see the first performance, Sally Marie’s I am 8, and then there will be a period for the audience to give impressions of what we had just seen and to ask questions of the dancers. Afterwards we will see Ross’s work There, There, Stranger and have the same period of reflection and questioning. Still not entering into the uncomplicated, non-psychological spirit of the evening, I was expecting eight dancers in I am 8 but there were only seven. In fact I spent the entire performance waiting for the revelation of the surprise eighth dancer. 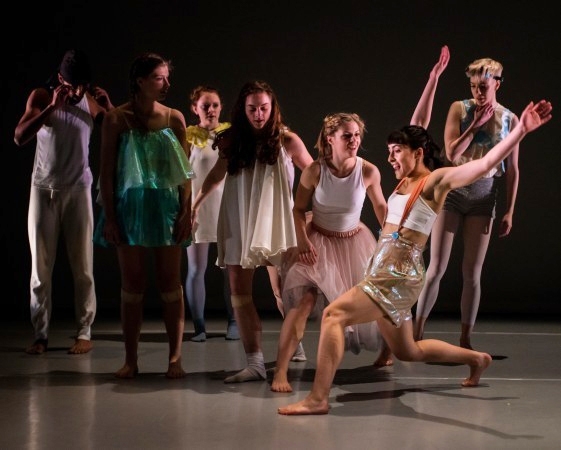 As any child will tell you, what her title refers to is seven dancers aged 21 acting out the stories of eight-year-olds. To do this Marie collected stories from school children, their experiences and dreams, and wove them into a dance for big children. I am 8 enters into childhood with a music box playing a nursery rhyme. There’s a girl in a tutu who has decided it is time (being 8) to put her Teddy in a box, a magician (Deepraj Singh) on an imaginary motorcycle and a girl who must have been mischievous in her childhood, so well does she portray a rebellious sense of fun here. Another girl says she finds it difficult talking in front of a group of more than five and two lively springs bounce in with buoyant jumps. All the girls gang up on Singh keeping him out of their circle. He finds a friend in the girl in green with whom he starts a duet that attracts everyone else (the story of Tubby the Tuba comes to mind). Remember these are real stories of the experiences of young children; all Marie has done is to change the perspective, elongate the lines, enlarge the voice by turning second year students at the London Contemporary Dance School into big kids as if they are reaching out across the age divide to provide assurance that life will remain fun at 21. And the children in the audience got it completely (“I loved it because it was really happy!”). 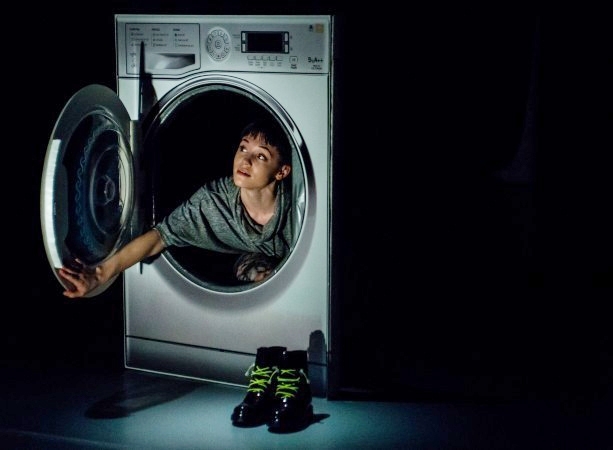 If Marie’s work takes the children’s perspective and grows it, Ross takes a more mature theme and scales it down, not unlike Lewis Carroll’s Alice in Wonderland except that Ellis Saul enters her imaginary world through a front loading washing machine. She meets a variety of bodies (or anti-bodies) wearing tight black body suits (Jordan Ajadi is still recognizable) including one (Antonin Chediny) wearing flippers, a diving mask and speaking French (a frogman?). I thought they were all specks of dirt loosened by the wash cycle but Ross’s conception was a labyrinth through which Saul navigates in an expedition of the mind that lasts as long as the wash cycle, a dream or nightmare if you like. At the end Saul reappears at the washing machine door, takes a look out but decides to remain inside, not forgetting to take her shoes. There is a surreal aspect, suspense (when the laundry basket comes alive), humour (when the penguin/frogman sneezes), and tension that set up fluid interpretations. Once you got Marie’s concept (unlike me) you could follow the dance easily; with Ross it was more complex and solicited more concentration and more questions from the audience. I like this approach because it stretches the imagination in a way the so-called fairy tales from the brother’s Grimm or Hans Christian Anderson or Charles Perrault did: they are sophisticated life lessons with dark shades of psychological drama raised to an other-worldly level that can be read on many different levels. Children can evidently take a lot more on board in their imaginations than we might be willing to admit.